This quick and easy to make Chinese noodle dish is perfect as a snack or main course and for hosting great parties. In its typical preparation boiled noodles are tossed with garlic, ginger, chopped vegetables, soy sauce, chilli sauce, tomato ketchup and spices that gives it its signature taste and texture. 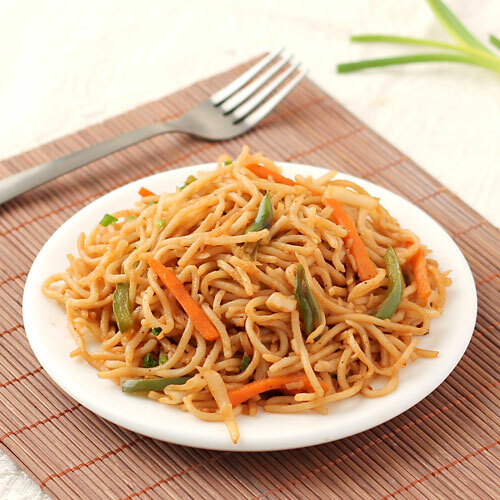 However, in order to get the restaurant like taste and texture it needs to be cooked in a certain way and this step by step recipe of veg hakka noodles explains it with photos and detailed instructions. The tips and serving ideas given after directions will also help you avoid some common mistakes which can ruin the dish. Boil the noodles by following step by step recipe of simple noodles or by following the instruction given on the pack of noodles. Cut the vegetables as mentioned in ingredients section. Make sure to chop the vegetables as thin as possible as they will take less time to cook. Heat 1-tablespoon oil in a wok (chinese style cooking vessel) or a wide mouthed pan over medium flame. Add minced garlic and minced ginger and stir-fry for 30 seconds. Add French beans and stir-fry for a minute. Add spring onion, capsicum, cabbage and carrot. Stir-fry vegetables until they are cooked but still crunchy for approx. 2-minutes over high flame. Add soy sauce, green chilli sauce, tomato ketch up, black pepper powder and salt (please note that we have also added salt while boiling noodles). Mix and toss until noodles are evenly coated with sauces and vegetables for approx. 1-minute. Turn off flame and transfer it to serving plate. Serve it with Hot and Sour soup or Dry Vegetarian Manchurian. To make non-sticky noodles, do not overcook them in step-1. Cook them until they are cooked but not mushy. Do not forget to pour cold water over noodles after cooking to remove excess starch. You can use either green chilli sauce or red chilli sauce per your preference. Red chilli sauce will help you get the typical restaurant color. Adjust quantity of chilli sauce and soy sauce per your taste. Do not add more soy sauce as it tastes bitter and it will change the taste of noodles. All vegetables and noodles must be tossed over over high-flame to get restaurant like taste and texture. For variation, add baby corns, red and yellow capsicum, mushrooms or any other vegetables of your choice.